Displaying three new, off-the-shelf designs for 2018, our recently launched Festive design hot cups provide the perfect receptacle for seasonal beverages, helping to spread Christmas cheer, even on the coldest of days. In recent years, it’s become popular for coffee shops and other catering operators to serve seasonal beverages in festive design hot cups. In 2017, coffee shop chain Starbucks released a toffee nut latte and coffee chain Costa released a Billionaire’s hot chocolate, to draw in customers looking to celebrate the festive season. Both were served in limited edition cups with a seasonal theme. 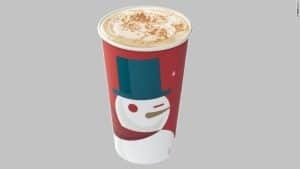 As the Christmas season approaches, coffee shop chains; Starbucks, Costa and Caffe Nero, all swap their regular coffee cups for a Christmas or festive themed cup. Starbucks serve coffee in the their now-famous red cups, which were launched in 1997. 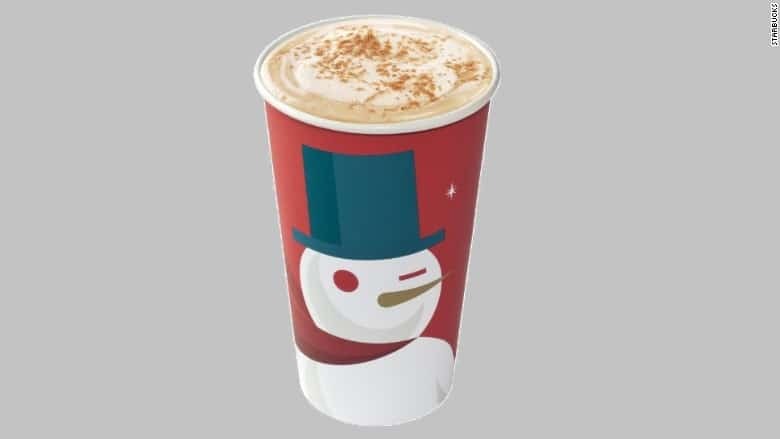 Every year the design on the red cup changes, for example, in 2012 their red cups featured a snow man animation and the latest cup in 2018 was solely red. Costa cups have animated characters on them, such as Santa Clause, gingerbread men and snow men. Each year their designs change, however the cups are always linked to a specific drink, for example, the gingerbread man cup is linked to their famous gingerbread latte. And Caffe Nero keep their cups extremely simple with a Scandinavian Christmas theme. Their cups feature illustrations of snow, Christmas trees, lights, mistletoe, and houses covered in snow. In a recent article on news website Business Insider a Starbucks employee said that the most popular time of year was November and December (during the Christmas period). The employee believed that sales increase because consumers are extremely excited about limited-edition drinks and cups. Starbucks revealed that sales during the festive period can increase by as much as 20 per cent. To help our customers stand out from their competitors, without the need to commit to a bespoke print, we’ve launched a range of off-the-shelf Festive design hot cups, available to purchase now in good time for the winter season. 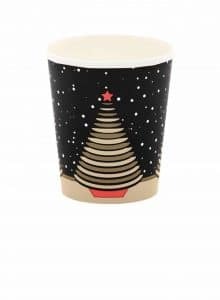 Available as single wall smooth and double wall rippled cups, our Festive design hot cups are made in the UK from PEFC Chain of Custody Certified Board. The first new design, called Christmas Tree Ribbon, is an elegant gold and red tree motif on a starry-night backdrop. This festive design sits on a single-wall cup and will fill customers with the wonder of Christmas as they enjoy a hot drink. The other two new cup designs are on double-wall cups: cosy red and green bobble hats that create an attractive symmetrical pattern on a winter-warmer theme; and Festive Skating themed rippled paper cups displaying penguins and polar bears enjoying some time on the ice. Our fantastic themed disposable hot cups come in either 8/9oz or 10/12oz sizes and can be recycled through the Simply Cups Scheme. The paper cups come in cases of 1,000, sized 8oz and 12oz, with a white or black sip lid. 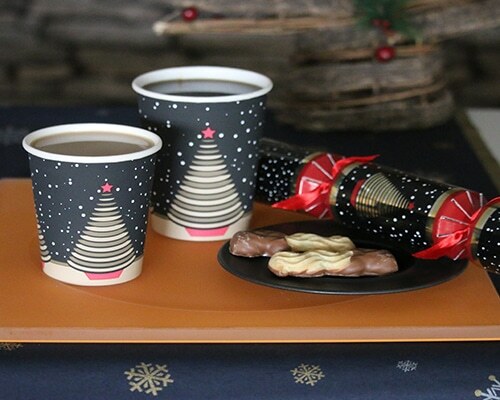 Our festive design hot cups join our Christmas collection 2018 Christmas brochure, packed full of crackers, tableware and party accessories to help foodservice operators deliver a successful party season. For more information on our Christmas hot cups visit our Christmas & New Year e-brochure.